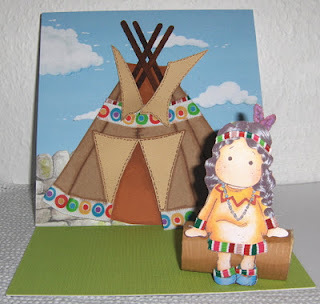 The theme of this weeks challenge on Sell Your Craft's Here is "Native American". Wasn't sure if I could come up with anything at first but remembered I had some Tilda stamped images lurking in the depths of my craft drawers and was nicely surprised to find this one. So after colouring in Tilda with my Promarkers I added a bit of adhesive ribbon for the dress trim and headband. I then set about making a log for her to sit on. This was made very simply by forming a tube out of wood effect card stock and filling in the ends with a circle of lighter brown card. I then cut out a wigwam shape out of Kraft card and added more adhesive ribbon for decoration. I cut out the door and ceiling flaps out of beige card and used a brown Promarker to draw stitching around the edges. I used the same Promarker to colour 4 coffee stirrers and used these as the wigwam poles. I made a simple 8 x8 easel card out of white card stock and used green card stock to cover the base, I then used a piece of Kanban background card to make the back of the easel. 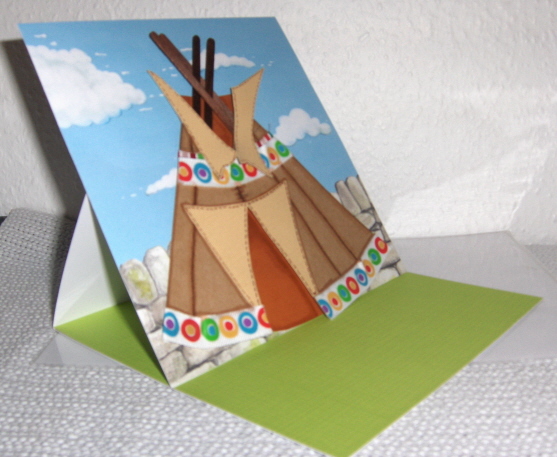 The wigwam was then mounted onto the card and Tilda was positioned in place. Just a simple fun card to enter into this weeks challenge - hope you like it.